Humorous Car Window Sticker - For Interior Use. 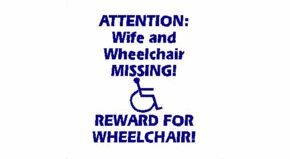 Sticker reads:"Attention wife and wheelchair missing... Reward for wheelchair""